We rode the RR 310 on track and came back with a huge grin on our faces. But is it impressive enough in real-world conditions? We have already spoken about how cool the RR 310 looks and how TVS Racing has stepped up the game for the company. After crunching numbers and testing the bike to its limits on our first ride at the MMRT racetrack in Chennai we came back mighty impressed. So, putting all the science of track riding aside, which can be read here, let’s see if it lives up to TVS’ claim of being a potent tool to live with on daily basis as well. Swing a leg over and you are welcomed by a cockpit that houses a vertically stacked white backlit instrument console. Going by the pictures of the console received from our first ride, the cluster seemed pretty cluttered. But spending a little time with it has got me feeling otherwise, as everything -- except for the tachometer readout -- is easy to decipher. There is a host of information on offer but scrolling through it is a bit stressful. The hazard indicator switch is unusually placed on the left side of the display and a toggle switch for the menu is on the right. The switchgear, derived from the BMW G 310 R, is well laid out. As a result, the quality is miles ahead of other TVS offerings and better than most from other manufacturers as well. There’s also a soft, positive click when you operate the switches. That aside, the motorcycle drips quality, be it the stitching on the seat, the paint and even the parts themselves. TVS has clearly outdone itself with the RR 310 on this front. Fit-finish is also impressive as there is no clatter from any of the plastic bits, neither are there any exposed or tacky-looking weld points. How does the motor feel? To start with, you don't need to hold on to the ignition switch to crank the motor. Just a single press is enough to crank up the 312.2cc motor. Once cranked, the revs build momentarily before the motor warms up and settles into a steady idle. That said, the engine sounds a bit rattly at idle, but that’s just its nature and takes a bit to get used to. Notch the 6-speed gearbox into first, release the light clutch and the bike picks up with just a hint of vibration. A point worth mentioning: though the gearbox is precise, it’s not exactly a slick shifter, with a hint of clunkiness when swapping cogs. The motor feels almost vibe-free between 3000rpm to 4000rpm, and this is good because you will find yourself in that rev range for most city riding conditions. However, rev it harder and the vibes start creeping on to the handlebars and foot pegs. The bit that really puts you off is the surge of vibrations felt on the seat between the 6000rpm to 7000rpm mark. Otherwise, the vibrations felt on the handlebars and pegs at high speeds is something you can expect from the RR 310 as standard. During our test run, the Apache RR310 managed the 30-70kmph stint in 3.54 seconds in third gear whereas 40-80kmph in 4th gear was achieved in 4.48 seconds. These are quite healthy numbers for a motorcycle that produces 34PS of peak power and has a kerb weight of 169.5kg. This tractability of the motor is even more apparent with a pillion on board, which we did test out. Even when riding two-up, the RR 310 was willing to pick up from slow speeds in high gears without any signs of lugging, feeling just as stable and responsive to rider inputs at that. Despite being a sportbike, the RR 310 gets an impressively tight turning radius. And that’s thanks to its wheelbase of 1365mm, which is just 8mm more than the 390 Duke - a street naked motorcycle. As a result, taking U-turns in tights spots isn’t cumbersome. It’s not the same story when it comes to cutting through dense traffic, though. This is mainly owing to its track-focused riding dynamics. So while the bike does react to the slightest shift in body weight or the lightest of inputs on the handlebars, you can’t expect it to dance around in ways that a street naked would. Is it cool enough to tackle hot traffic days? TVS did put a lot of emphasis on heat management of this motorcycle. But then there’s also the fact that a lot of manufacturers claim to have perfected or improved engine heat management on their products, only to succumb to our incredibly hot riding conditions. So we had to test it for ourselves to finally resolve this claim. For that, we opted for the most densely populated day of the week: Friday. This proved to be perfect because Friday is when people jam the city roads to rush home to begin their weekends. All said and done, we were utterly flabbergasted with the results. This is one of the rare bikes we have managed to take home without the feeling of our legs being grilled on a tandoor. We barely had to tolerate any heat and could feel just some of it on our feet in crawling traffic conditions. Nothing to complain about in this department then! Sportbikes aren’t really comfortable… Or are they? Well, this is a sportbike in the end, so you can’t really term it as the ideal choice over something like a street naked, which offers a lot more comfort. But TVS has kept that in mind to make this track tool road-friendly as well. So, the outcome? Seating position is not as focused as you would find on the KTM RC390, which translates to comparatively relaxed ergonomics. TVS has achieved this by offering rider footpegs that aren’t overly rear-set or high up. The clip-on handlebars are also slightly raised so you don't really have to lean in a lot. This setup translates to almost no pressure on your shoulders, back, and even your wrists. However, extremely long hours in traffic will put some amount of pressure on your palms. Nevertheless, it is an engaging posture to ride, and a lot more welcoming in the real world than something like the KTM. Speaking of ride time on the saddle, it is a plush seat with just the right balance of padding. As a result, you can spend long hours on it with ease. There is also plenty of room for the rider to move around. Unfortunately, it isn’t the same case for the pillion. The seat is placed quite high, is on the firmer side, and is smaller than other bikes in the segment. With no grab rails for the pillion, it's an even more uncomfortable place to be. With a seat height of 810mm, even 5.5-feet-tall riders should be able to manage the machine with both feet on the ground. Meanwhile, a ground clearance of 180mm allows you to tackle most tall bumps with ease. I for one thought that the RR would scrape with two on board, but surprisingly, it tackled the worst without any problems. Well, not really. We ran the Apache RR 310 through our standardised tests and in city traffic conditions it returned 31kmpl, the bike not exceeding the 50kmph mark. On the open highways, it managed better efficiency numbers, returning 35.9kmpl while maintaining a speed limit between the 90-100kmph mark. This, in our books, is an admirable figure for a 300cc motor. Riding long hours will eventually put some strain on your palms and wrists but otherwise, the wind deflection is impressive; one can easily cruise at 100kmph without any helmet buffeting. The engine’s vibey nature may put you off but there is plenty of grunt no matter what rpm you’re in. So overtaking is a breeze. All you need is a twist of the throttle. No complaints from the suspension either as the damping is well sorted, remaining composed even when tackling bad patches at high speeds, with not much vertical movement. What about in the dark? Well, it’s got bi-LED headlights which lets it run both high and low beams at the same time through both headlamp units. Are they bright? YES! But not as bright as the ones on the Dominar. The low beam has a more focused throw with barely any spread, whereas the high beam provides a widespread that is high enough to even shoo off owls from the trees around. The Apache RR 310 comes with a 300mm petal disc up front and a 240mm petal disc at the rear. Lest we forget, it has the safety net of dual-channel ABS. To date, the Kawasaki Ninja 300 scored the weakest brake timings in the 300cc segment in our tests, managing 80-0kmph in 37.79 metres. This was mainly owing to the hard compound IRC tyres. The Apache RR 310 seems to be the second weakest timer in our records now: It manages to stop from 80kmph in 37.49 metres, which isn’t that impressive. And this is partly because of the Michelin tyres and partly because of the overly intrusive rear ABS unit. Moreover, the front brake fails to transfer any sort of feedback to the rider, almost feeling numb. Add to that a very unnatural fork dive that will take time to get used to. On the other hand, the rear brake is very responsive and the slightest of inputs will drop the anchors. Thanks to that, the rear tyre wants to lock up even before you know it. As a result, the rear ABS kicks in to correct the wheel slip, barely giving the otherwise potent brakes a chance to do their job. At Rs 2.15 lakh (ex-showroom, Delhi) the TVS Apache RR 310 may seem too steep for some. But at this price, the bike does make for a good value proposition. It's powered by a BMW motor; gets components like USD front forks, adjustable rear monoshock, dual-channel ABS; boasts top-notch build quality, a wind-tunnel tested fairing and heat dissipation vents that actually work. What’s more, it will get you the stares you crave for. But bear in mind that the brakes are a letdown due to the tyres, and there is barely any saddle room for the pillion. So, if you are willing to live with those tyres and already have a petite girlfriend by your side, the RR 310 makes a strong case for itself to make its way into your life. Mainly because it offers plentiful grunt, impressive ride quality and great seating comfort for the rider. Points that clearly hint towards a rider-focused motorcycle that allows you to hit the twisties, the track and even deal with your daily chores without much hassle. 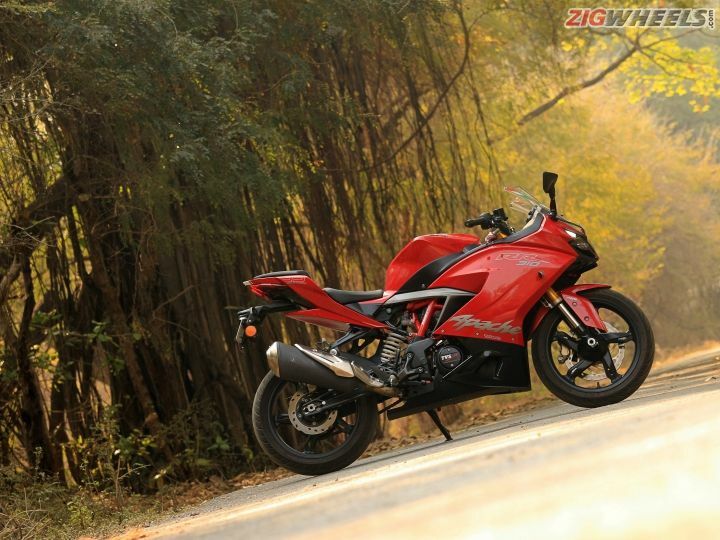 TVS Apache RR 310 - Where Can You Buy It?